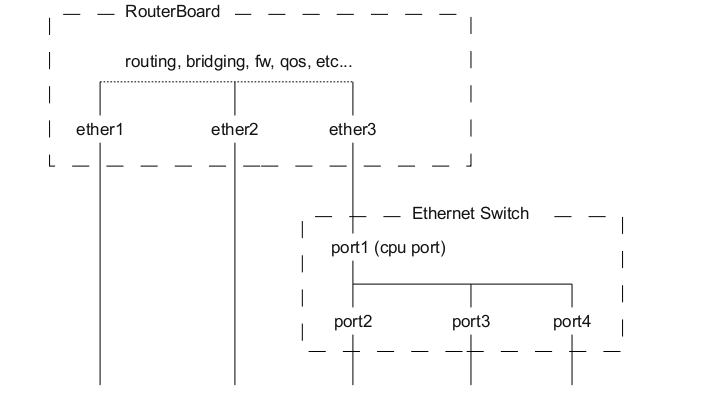 Since RouterOS v6.41 there are user interface changes which convert RouterBoard master-port configuration into a bridge with hardware offloading. From now on bridges will handle all Layer2 forwarding and the use of switch chip (hw-offload) will automatically turn on if appropriate conditions are met. The rest of RouterOS Switch features remain untouched in usual menus. By default all newly created bridge ports have hw=yes option and it allows enabling of hw-offload when possible. If such functionality is not required, it can be disabled by /interface bridge port set hw=no on bridge port to have completely software operated bridging. Following table states what features currently keeps bridge hardware offloading enabled on certain RouterBOARD and switch chip models. Since RouterOS v6.43 it is possible to create an uplink port and isolated ports. Such a configuration allows each device connected to a switch port to be isolated from other ports and these isolated ports are only capable of communicating with other devices through the uplink port. 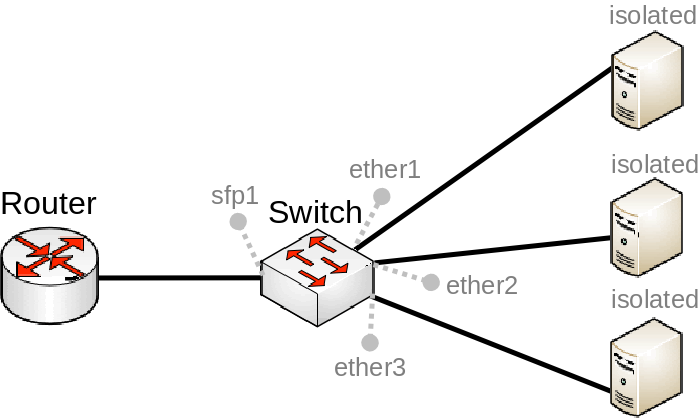 This kind of configuration can also be called Private VLAN configuration, the Switch will forward all Ethernet frames directly to the uplink port allowing the Router to filter unwanted packets and limit access between devices that are behind switch ports. Note: Since RouterOS v6.41 the master-port configuration is removed and replaced with a more simplified bridge configuration. The same functionality can be achieved by adding ports to a bridge with hardware offloading enabled and ensuring that protocol-mode is set to RSTP.